First developed in the 1980s, handycling is an adapted form of cycling that is now a Paralympic sport. At Craig Hospital handcycling is considered a gateway activity that often leads to other therapeutic recreational activities. For many patients getting on a bike again shows them there is hope for independence. Today, Craig Hospital has a fleet of 25 different bikes, which range from handcycles to recumbent bikes. There are several different options of handcycles for different skill levels and levels of injury. For people with quadriplegia there are bikes that have great, new technology. Now, there are modifications not just for entry level cycling, but for high level competition as well. 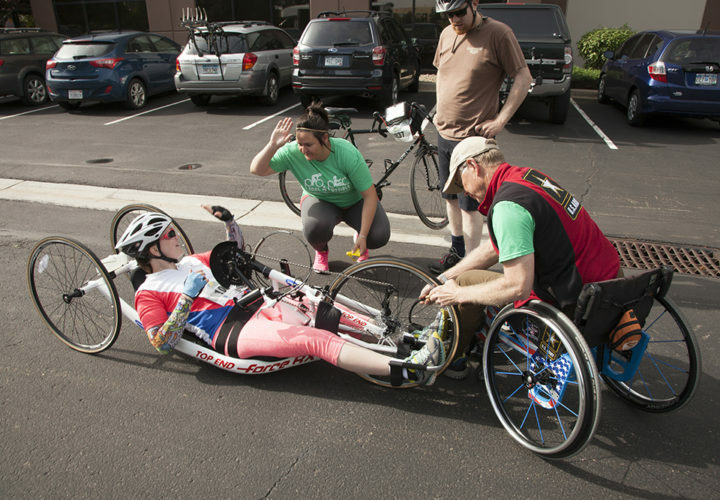 Handcyclists interested in testing out their new skills should join the cyclists and handcyclists participating in the 2nd annual Pedal for Possible, Century Ride for Craig Hospital. Nearly 300 cyclists, including many current and former Craig Hospital patients, participated in Pedal 4 Possible in 2015. Nearly 300 cyclists, including many current and former Craig Hospital patients, participated in the charity bike ride, last year. Riders chose between a 10K, 50K, 100K and 100-mile route. All cyclists started and ended at the Colorado Technology Center (CTC) in Louisville. This year’s ride starts at the headquarters of the active wear retailer Pearl Izumi. All money raised will fund innovative therapy programs that help Craig Hospital patients affected by spinal cord and traumatic brain injury thrive, such as therapeutic recreation, the Nurse Advice Line, the PEAK Center and many more.